When we reviewed the Amazon Echo last year, we hailed it as the best home-based voice-controlled product at the consumer level. It’s become even more versatile and powerful since then. It can control your home’s smart lighting, lock your smart lock, play music, provide weather forecasts, order a pizza, and more. This affordable, always-on personal assistant can manage not only your home, but much of your digital life. It’s so useful, we predicted many folks would want more than one Echo in their home. Fast forward a year and the Echo is a bona fide hit. So it’s no surprise that Amazon developed a less-expensive follow-up: The Amazon Tap, a smaller, battery-powered, and portable version. Like the Echo, it comes with a built-in speaker. More importantly, the Tap is powered by Amazon’s cloud-based, voice-activated digital assistant, Alexa, which is constantly gaining new features. The Tap, unfortunately, suffers from a major flaw that keeps it from being the little taste of the future that characterizes its older, more-expensive sibling. In short, we can’t recommend it. 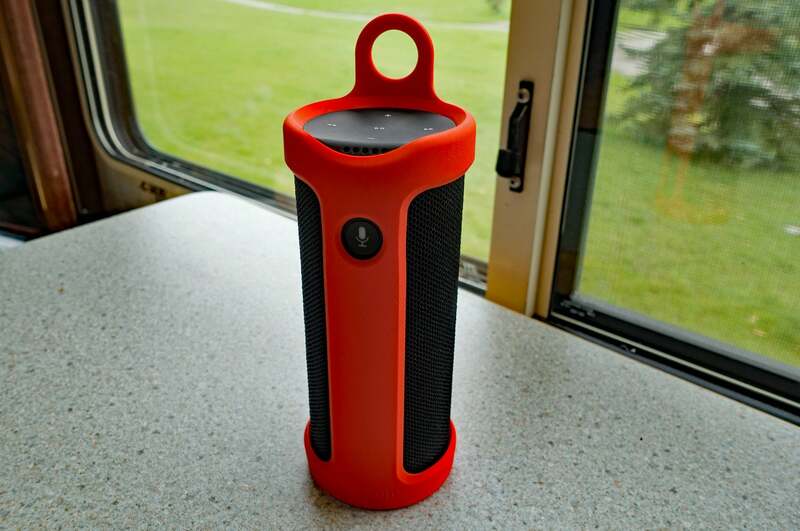 The Amazon Tap is a portable battery-powered Bluetooth speaker and portal to Amazon’s powerful Alexa virtual assistant. The Tap measures 6.2 tall and 2.6 inches in diameter, and it weighs 16 ounces. It’s light and compact enough that I didn’t think twice about tossing it in my backpack. I wasn’t worried about damaging it, even without its optional $20 silicone Sling case. It’s a sturdy, well-built piece of hardware. On the go, you can charge the Tap via micro USB cable. At home, you can plunk it on top of its charging base (but you’ll need to remove the Sling, first). Amazon says that a full charge will yield you about nine hours of use. I found this estimate to be pretty accurate. The Tap’s volume, track controls, and status lights are on the top of the device. 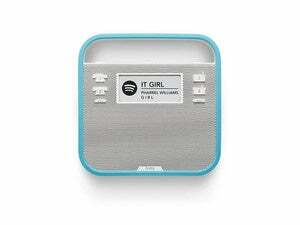 A button for getting Alexa’s attention is on the front (more on that later). There’s a mini-USB charging port, an auxiliary input jack, and power and pairing buttons on the back of its cylindrical body. The Tap can be connected to your Wi-Fi network or tethered to your smartphone or tablet. You can also stream music to it via Bluetooth. The pairing button serves two functions: a single push puts the Tap into Bluetooth-pairing mode. Hold the button down for five seconds, and you can connect the Tap to your Wi-Fi network (you can also tether the device to a tablet or smartphone. You’ll need a connection to the internet in order to use Alexa.) Pairing the Tap with my iPhone SE couldn’t have been easier. After downloading the Amazon Alexa app, I was guided through the setup process by on-screen and audio prompts in less than five minutes. 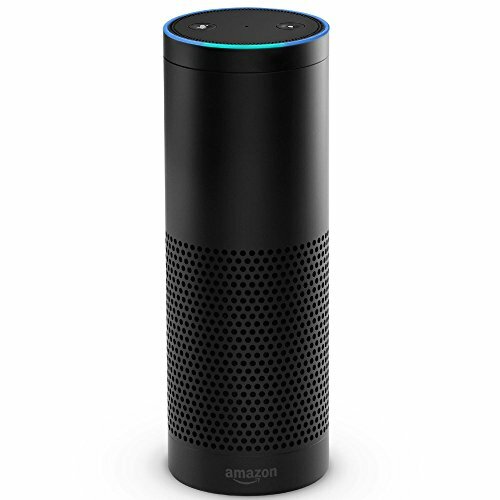 Unlike Amazon’s Echo, which allows for hands-free voice interaction with Alexa, you must physically push the Tap’s microphone before you can ask Alexa to turn on the Hue lights in your living room, to give you a weather forecast, to play your favorite Amazon Prime Music playlist, or to do any of the other things that make Alexa so fun and useful. The ability to accomplish such tasks using nothing more than your voice is one of the Echo’s principal attractions. It’s something we’ve dreamed of since the earliest science-fiction stories. Needing to push a button before uttering your request? That’s like Scotty mistaking a mouse for a microphone needed to control that old Mac in Star Trek IV. Unlike the Echo, the Tap requires a button-push to get Alexa's attention. After listening to a wide range of music, I found that the Tap performed best at low to mid volume. Push the volume any higher and you’ll start to hear distortion. In fact, I found the music I listened to on the Tap even at middling audio levels lacked the kind of aural separation that makes me happy. “Low Life,” from the X Ambassadors’ album VHS, is a low-end heavy track. The Tap couldn’t breathe life into the music. Bruce Springsteen’s “Working on the Highway,” from Born in the USA, fared a little better. I chanced turning it up about 70 percent of my iPad Pro’s maximum volume. Unfortunately, when I did so, I was found that the Tap made the song sound strained and muddy. The Amazon Tap in its optional $20 silicon Sling Case, which has a loop for attaching it to a carabiner or backpack strap. Amazon pitches the Tap as an “Alexa-enabled portable Bluetooth speaker;” in other words, a mobile Echo. It’s not. 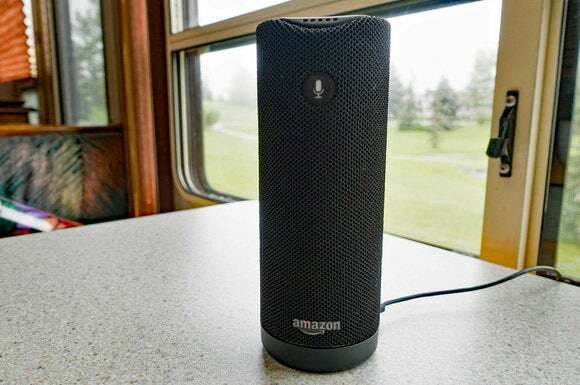 Without hands-free access to Alexa, and with even more lackluster audio capabilities, the Tap is more of a digital curiosity than a virtual necessity. If you want to bring Alexa into your home, spend the extra money on the Amazon Echo. You’ll be much happier with your investment.